Employees attach value to their job features/total job and when they perceive threats to these and experience feelings of powerlessness, their level of job insecurity increases. Since job insecurity is a subjective phenomenon, the study aims to assess who is more susceptible to experiencing job insecurity by assessing biographical correlates. The research adopts a formal, hypothesis-testing approach where quantitative data were collected using a cross-sectional, survey method from a sample of 1620 employees. 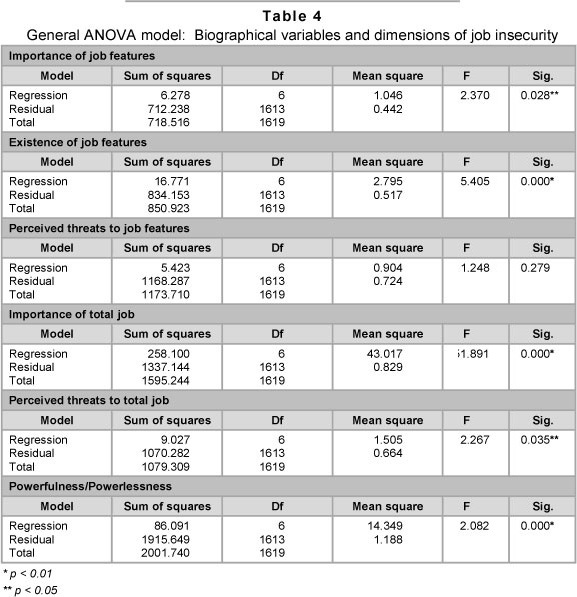 The results, generated using the ANOVA model, indicate that biographical influences do exist in terms of job insecurity. The implication is that change managers need to take cognisance of these influences and develop suitable strategies for each group to reduce the prevalence of job insecurity. Recommendations are made in this regard. Working life has been subject to dramatic change over the past decades as a result of economic recessions, new information technology, industrial restructuring and accelerated global competition (Hartley, Jacobson, Klandermans & van Vuuren, 1991; Hellgren, Sverke, & Isaksson, 1999). As a consequence, organisations have been forced to engage in various adaptive strategies in order to tackle new demands and remain vigorous in this unpredictable environment. They have two options to become more profitable; they can either increase their gains or decrease their costs, often by reducing the number of employees (Burke & Cooper, 2000; Tetrick & Quick, 2003). These organisational options often surface in actions like outsourcing and privatisations, often in combination with personnel reductions through layoffs, offers of early retirement and increased utilisation of sub-contracted workers (Burke & Cooper, 2000; Tetrick & Quick, 2003). These changes have impacted tremendously on organisational structures and have created a continuous need for organisational changes in terms of retrenchments, rightsizing, mergers and acquisitions and downsizing. As a result of these changes, job insecurity has emerged as one of the most important issues in working life and has brought the issue of insecure working conditions to the forefront (Sverke, Hellgren & Näswall, 2002).  Powerlessness and inability of the individuals to control the above mentioned factors. Job insecurity is more than the perceived threat of job loss but also includes thoughts about losing valued job features such as pay, status, opportunity for promotion and access to resources. Very often individuals further characterise the threats to the entire job as more severe than the threats to the job features, because one can lose one's job features but still maintain organisational membership. However, loss of the entire job entails potential job loss or loss of career advancement (Greenhalgh & Rosenblatt, 1984). Likewise, Hellgren et al. (1999) differentiate between two different forms of job insecurity: quantitative job insecurity, that is, worrying about losing the job itself, and qualitative job insecurity, that is, worrying about losing important job features. Whilst quantitative job insecurity is related to the general, comprehendsive operationalisation of the construct, qualitative job insecurity refers to feelings of potential loss in the quality of the organisational position, such as, worsening of working conditions, lack of career opportunities and decreasing salary development (Sverke & Hellgren, 2002).  Cognitive job insecurity, which refers to the likelihood of job loss.  Affective job insecurity, which refers to the fear of job loss.  The importance of job features: This determines the salience of job features such as pay, status, opportunity for promotion, access to resources, career opportunities, and position within the organisation.  The existence of job features: This determines the extent to which salient job features exist in the organisation.  Perceived threats to job features: This refers to the estimated likelihood of losing salient job features and feelings that important job features are being threatened.  Importance of the total job: This determines how salient the total job is to the individual.  Perceived threats to total job: This refers to the estimated likelihood of one's job itself being at risk or perceptions of losing one's job.  Feelings of powerfulness/powerlessness: For example, during a process of transformation individuals do not know how to protect themselves and this sense of powerlessness of being unable to secure their futures intensifies the insecurity that they experience. Greenhalgh and Rosenblatt (1984) indicate that job features are as important as the total job, because loss of valued job features represents some aspects of job insecurity, but will be less severe than losing the total job itself. Brun and Milczarek (2007), like Chovwen and Ivensor (2009), find a significant relationship between the existence of job features and perceived threats to job features, such as position within an organisation or career opportunities. This reveals that although the job features do exist, individuals perceive that threats to these job features are a result of the restructuring that is taking place in the organisation. Ugboro and Obeng (2001) find that the relationship between perceived threats to job features and perceived threats to the total job have direct significance. This indicates that as threats to job features increase so do the threats to the total job. Since job insecurity involves the experience of a threat, and implies a great deal of uncertainty regarding whether individuals get to keep their jobs in the future, it has been described as a stressor (Barling & Kelloway, 1996; De Witte, 1999; Mauno & Kinnunen, 1999). Like other work-related stressors, job insecurity is associated with a number of detrimental consequences for both the individual and the organisation. The perception of job insecurity is frequently linked to reduced organisational commitment (Borg & Dov, 1992; Forbes, 1985), job satisfaction (Lord & Hartley, 1998), job involvement (Sverke et al., 2002), job performance and productivity (Dunlap, 1994), work effort (Brockner, Grover, Reed & De Witte, 1992), mistrust in management (Ashford, Lee, Bobko, 1989; Forbes, 1985) and intention to leave the organisation (Ashford et al., 1989; Davy et al., 1997; Greenhalgh & Rosenblatt, 1984). Job insecurity is also associated with decreased safety, motivation (Borg & Dov, 1992; Greenhalgh & Rosenblatt, 1984) and compliance, increasing the risks of workplace injuries and accidents (Probst & Brubaker, 2001). Evidently, job insecurity is consistently associated with lower levels of relevant job attitudes and behaviours. Furthermore, job insecurity is also associated with higher levels of burnout, anxiety and depression and psychosomatic complaints (De Witte, 1999; Hartley et al., 1991). Several research studies have suggested that job insecurity should be related to different negative outcomes which may be roughly categorised as attitudinal, health related and behavioural (Ashford et al., 1989; Dekker & Schaufeli, 1995; et al., 1994; Sverke & Hellgren, 2002; Hellgren et al., 1999; Probst, 2003; Sverke et al., 2002). Prolonged job insecurity is more detrimental and acts as a chronic stressor whose negative effects become more potent as time goes by (Dekker & Schaufeli, 1995), thereby emphasising the importance of early identification of its occurrence. Evidently, job insecurity is a subjective phenomenon. Hence, the aim of the study is to determine whether specific biographical correlates exist in terms of job insecurity in order to assess which employees, if any, are susceptible to job insecurity. Villosio, Di Pierro, Giordanengo, Pasqua and Richiardi (2008) find a significant relationship between age and importance to job features indicating that older workers attach more importance to job features than younger workers. Mohr (2000) finds a strong, direct relationship between age and threats to job features, indicating that older employees experience more threats to job features than younger employees. Sverke, Hellgren and Näswall (2006) find a significant relationship between age and importance of total job, where employees in their 30s and 40s attach more importance to total job because of their family responsibility. Green (2008) and Mauno, Kinnunen, Mäkikangas & Nätti (2005) and Villosio et al. (2008) find that younger workers are likely to feel more insecure than older workers. However, Pedraza and Bustillo (2007) find a significant difference in the level of threat to total job experienced by employees in the different age groups, indicating that younger workers between the ages of 16 and 24 do not fear losing their jobs, because they do not have family responsibilities unlike those who are above 45 years. According to Bender and Sloane (1999), a strong relationship is found between tenure and the importance that individuals attach to their jobs. Maurin and Postel-Vinay (2005) find that workers on a fixed-term contract attach less importance to their job features than those on permanent contracts. Cheng and Chan (2008) find a significant relationship between tenure and threats to job features. Bender and Sloane (1999), unlike Ugboro (2003), find a strong, direct relationship between tenure and powerlessness. Ugboro and Obeng (2001) find that White employees attach less importance to their job features because of the insecurity that they feel whereas their other counterparts attach more importance to job features. However, Burgard, Brand and House (2006) find that Blacks indicated less attachment to their jobs as compared to their non-Black counterparts. Orpen (1993) finds a significant relationship between threats to job features and race indicating that Black employees experience more threats to job features than White employees. Van Wyk and Pienaar (2008) find a significant relationship between perceived threats to total job and race, indicating that White employees experience higher levels of threat to their total job than their Black counterparts. Labuschagne, Bosman and Buitendach (2005), unlike Jorge (2005), find that White employees experience more powerlessness and job insecurity than Black employees. Ugboro and Ubeng (2001) find that individuals who have spent a number of years in their current position do not attach importance to their job features; however, they do feel powerless. Thus, employees with very short and with very long job tenures in their current position experience a relatively high level of job insecurity and attach less importance to their job features (Erlinghagen, 2007). Male employees experience more insecurity than females and may feel that organisational change will affect the features of their jobs (Ugboro & Obeng, 2001). However, Green (2008) finds that female employees are more insecure than male employees thereby indicating that males are more confident of the existence of the salient features in their jobs. Erlinghagen (2007), on the other hand, finds no gender-specific differences with regard to job insecurity and Burke, Mattiesen, Einarsen, Fiskenbaum and Soiland (2008) reveal no relationship between gender and importance of job features. Ojedokun (2008) reveals that there is a significant difference in the threats perceived by males and females regarding their job features. Likewise, Rosenblatt, Talmud and Ruvio (1999) find a significant difference between the genders and perceived threats to job features, in that, men are more insecure than females because they emphasise financial concerns and family responsibilities whereas women express concerns about their job features, such as, work content and work schedule. Furthermore, Rosenblatt et al. (1999) and Elizur (1994) find a significant difference between gender and importance of total job in that females attach more importance to their jobs than males. However, Mauno and Kinnunen (2002), Bridges (1989) and Tolbert and Moen (1998) indicate that males attach more importance to their jobs than females. Harpaz (1990) and Scozzaro and Subich (1990) find no gender differences in this regard. Whilst Erlinghagen (2007) found no genderspecific differences with regard to threats to total job, Kinnunen, Mauno, Nätti and Happonen (2000) find that women feel more threatened by job insecurity and display higher levels of powerlessness than males in the banking sector whilst the converse is true in the study of Mauno et al. (2005). Whilst no results were found for region, results for different countries were noted. Green, Burchell & Felstead (2000) identify Bulgaria, France, Russia and the UK as the countries with the highest levels of job insecurity and Denmark, Norway, the USA and Netherlands as those with the lowest levels. Bustillo and Pedraza (2007) find significant differences in the perceptions of people living in different regions (Belgium, Germany and the Netherlands) towards perceived threats to job features. Probst and Lawler (2006) indicate a significant relationship between countries (China and the US) and the importance of total job and job insecurity respectively indicating that people in the US attach more importance to total job and experience less job insecurity than employees in China. Undoubtedly, the increasing antecedents and the detrimental consequences (individual and organisational) of job insecurity necessitate the study of the potential biographical correlates so as to attempt to reduce susceptibility to job insecurity in the future. In this study, the target population consists of 8341 employees from a telecommunications company. The population is made up of employees from the Gauteng and KwaZulu-Natal provinces. A sample of 1620 employees was drawn from both regions using a probability sampling technique, namely, simple random sampling, whereby subjects were extracted using a random number selection process. According to Sekaran (2003), the corresponding minimum sample size for a population size of 8341 is 367, which confirms that the sample size of 1620 is more than adequate for the study. The adequacy of the sample for conducting Factor Analyses was further determined using the Kaiser-Meyer-Olkin Measure of Sampling Adequacy for the measurement of Job Insecurity (0.914) and Bartlett's Test of Sphericity (66210.340; p = 0.000), which respectively indicated suitability/adequacy and significance. The results indicate that the normality and homoscedasticity preconditions are satisfied. When categorised on the basis of region, the majority of the respondents (63.8 per cent) were from Gauteng whilst 36.2 per cent were from KwaZulu-Natal. In addition to region, the sample is classified on the basis of biographical data, namely, age, tenure, race, number of years in current position and gender. In terms of age, the highest percentage of respondents (42.1 per cent) fell in the age group of 30-39 years, followed by 40-49 years (36.5 per cent), 50 years and above (12.5 per cent) and 20-29 years (8.8 per cent) respectively. The majority of the respondents are in the age group 30-49 (78.6 per cent). In terms of tenure, 54.5 per cent of the respondents had been working at the company for 16 years or more, 28.1 per cent for between 6 and 10 years, 9.3 per cent for between 0 and 5 years and 8.1 per cent had been serving the organisation for 11 to 15 years. Furthermore, the majority of respondents are Whites (45.1 per cent), followed by Blacks (28.1 per cent), Indians (19.2 per cent) and then Coloureds (7.6 per cent). When distinguished on the basis of number of years in current position, it is evident that 53.8 per cent of the respondents have been in their current position for more than ten years, 23.7 per cent for between 7 and 9 years, 11.9 per cent for between 0 and 3 years and 10.6 per cent for between 4 and 6 years. Furthermore, the sample is comprised of 74.3 per cent male respondents and 25.7 per cent females.  Powerfulness/powerlessness which encompass an individual's ability/inability to counteract the threats (3 items). Those who are high in powerfulness or low in powerlessness should not experience much job insecurity. These sub-dimensions were measured on a 1 to 5 point itemised scale ranging from very unimportant (1) to very important (5) and, a 1 to 5 point Likert scale ranging from strongly disagree (1) to strongly agree (5). In-house pretesting was adopted by distributing the designed questionnaire to colleagues and experts in the field to comment on the items, structure and layout of the measuring instrument. In addition, pilot testing was used to detect whether weaknesses in the design and instrumentation of the questionnaire exist, using the same protocols and procedures as those designated for the actual data collection process. Fifteen questionnaires were distributed to various categories of employees that reflected the demographics of those included in the main study. The pilot study confirmed, interalia, the adequacy of the items. The validity of the questionnaire was statistically analysed using Factor Analysis (Table 1). The Principal Component Analysis was adopted using the Varimax Rotation Method and 6 Factors with latent roots >1 were generated. Only items with loadings >0.5 were regarded as being significant and when an item was significant on two or more factors, only the one with the greatest loading was considered. Table 1 indicates that sixteen items load significantly on Factor 1 and account for 11.84 per cent of the total variance in determining job insecurity. Since all sixteen items relate to perceived threats to job features, Factor 1 may be labeled likewise. Furthermore, Table 1 indicates that fifteen items load significantly on Factor 2 and account for 9.39 per cent of the total variance in determining job insecurity. Since all fifteen items relate to importance of job features, Factor 2 may be labeled likewise. Table 1 also reflects that fourteen items load significantly on Factor 3 and account for 9.34 per cent of the total variance. Since all fourteen items relate to existence of job features, Factor 3 may be labeled as existence of job features. From Table 1 it can be noted that eight items load significantly on Factor 4 and account for 7.35 per cent of the total variance in determining job insecurity. Since all the items relate to importance of total job, Factor 4 may be labeled likewise. It is evident from Table 1 that eight items load significantly on Factor 5 and account for 6.52 per cent of the total variance. Since all eight items relate to perceived threats to total job, Factor 5 may be labeled likewise. Table 1 reflects that five items load significantly on Factor 6 and account for 4.17 per cent of the total variance in determining job insecurity. Two items relate to perceived threats to total job and three items relate to powerfulness/powerlessness. Since more items relate to powerfulness/powerlessness, Factor 6 may be labeled such since the three items had moderate to high item loadings. The reliability of the questionnaire was statistically assessed using Cronbach's Coefficient Alpha and indicated a very high level of internal consistency of the items (Alpha = 0.901) with item reliabilities ranging from 0.899 to 0.902 and hence, reflecting a very high degree of reliability. Descriptive statistics (frequency analyses, mean analyses and standard deviations) and inferential statistics (general ANOVA model) were used to analyse the results of the study. Table 2 indicates the descriptive statistics for each of the sub-dimensions of job insecurity. The greater the mean score value, the greater the extent to which the sub-dimension exists. However, in the powerfulness/powerlessness sub-dimension of job insecurity, the greater the score value, the greater the extent of powerfulness and the less the degree of powerlessness displayed. Table 2 reflects that employees strongly reflect that job features are very important to them (Mean = 4.28). However, whilst they do believe that these job features do exist in their jobs (Mean = 3.54), it is evident that they perceive a high level of threat to these job features (Mean = 3.25) that are so valued. Likewise, Table 2 reflects that employees believe strongly that their total job is important to them (Mean = 3.88). However, they do perceive that their total job is under threat (Mean = 2.88). The interactive influences of all the biographical variables (gender, age, tenure, race, number of years in current position, region) result in significant differences in overall job insecurity amongst employees (Table 3). Table 3 indicates that all of the biographical variables combined (gender, age, tenure, race, number of years in current position, region) significantly influences overall job insecurity amongst employees. Hence, hypothesis 1 may be accepted at the 1 per cent level of significance. The interactive influences of all the biographical variables (gender, age, tenure, race, number of years in current position, region) results in differences in each of the dimensions of job insecurity (importance of job features, existence of job features, perceived threats to job features, importance of total job, perceived threats to total job, powerfulness/powerlessness) amongst employees respectively (Table 4). Table 4 indicates that all of the biographical variables combined (gender, age, tenure, race, number of years in current position, region) significantly influence three of the dimensions of job insecurity (existence of job features, importance of total job, powerfulness/powerlessness) amongst employees, at the 1 per cent level of significance and a further two dimensions of job insecurity (importance of job features, perceived threats to total job) amongst employees, at the 5 per cent level of significance. Table 4 also indicates that all the biographical variables combined do not influence employees' perceived threats to job features. Hence, hypothesis 2 may be accepted in terms of all the dimensions of job insecurity except for perceived threats to job features. 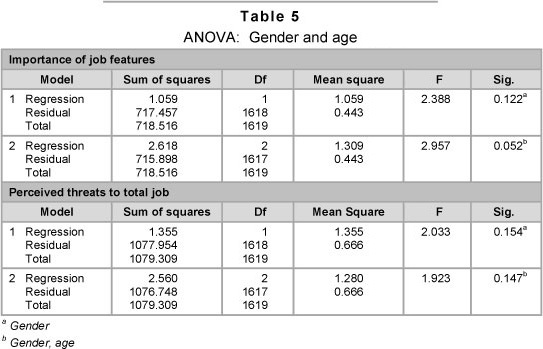 Although the interactive influence of all the biographical variables on importance of job features and perceived threats to total job are significant, in-depth analysis indicates that gender and, gender and age interactively do not significantly influence these dimensions of job insecurity (importance of job features, perceived threats to total job) (Table 5). From the results, it is evident that whilst employees experience a high level of perceived threat to their job features (Mean = 3.25) and a high level of perceived threat to their total job (Mean = 2.88), they also reflect a moderate level of powerfulness/powerlessness, which reflects their potential to experience job insecurity. The study aims to obtain a biographical profile of employees who may be more susceptible to experiencing job insecurity in an organisation undergoing major restructuring. The interactive influence of all the biographical variables (gender, age, tenure, race, number of years in current position, region) result in significant differences in overall job insecurity amongst employees (Table 3). 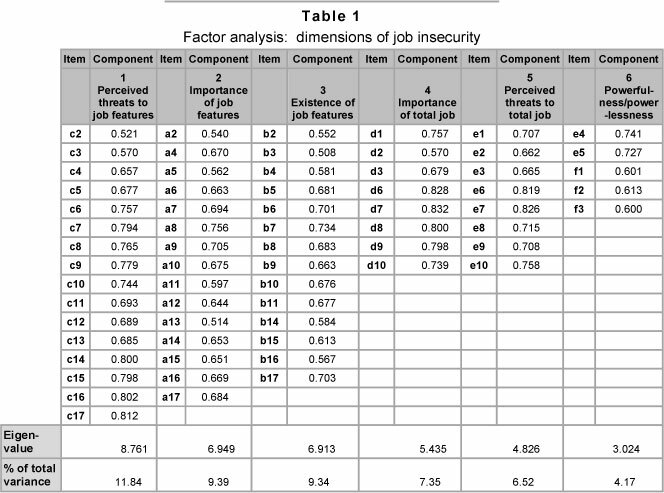 Furthermore, the aggregated effects of the biographical variables on each of the dimensions of job insecurity (importance of job features, existence of job features, perceived threats to job features, importance of total job, perceived threats to total job, powerfulness/powerlessness) amongst employees were assessed. The results indicate that all of the biographical variables combined (gender, age, tenure, race, number of years in current position, region) significantly influence five of the six dimensions of job insecurity (importance of job features, existence of job features, importance of total job, perceived threats to total job, powerfulness/powerlessness), thereby reflecting no significant influence on perceived threats to job features. With regard to the influence of age, Kam (2003) finds that older people are more associated with powerlessness than younger people whilst Kinnunen et al. (2000) find that powerlessness is not significantly influenced by age. The influence of tenure on job insecurity is supported by the studies of Bender and Sloane (1999), Maurin and Postel-Vinay (2005), Ugboro and Obeng (2001) and Erlinghagen (2007) and, by Cheng and Chan (2008) in terms of threats to job features. The influence of race on job insecurity is supported by the studies of Ugboro and Obeng (2001), Burgard et al. (2006), Cheng and Chan (2008), Orpen (1993), Buitendach, Rothman and De Witte (2005) and van Wyk and Pienaar (2008). With regard to gender, Mauno et al. (2005) find that men reported more powerlessness than women; however, Kinnunen et al. (2000) find the converse. Whilst other studies did not assess the influence of region, Probst and Lawler (2006) find a significant relationship between countries and importance attached to total job. It must, however, be noted that although the interactive influence of all the biographical variables on importance of job features and perceived threats to total job are significant, in-depth analysis indicates that gender and, gender and age interactively do not significantly influence these dimensions of job insecurity. The aggregated biographical variables (gender, age, tenure, race, number of years in current position, region) significantly influence overall job insecurity and, all the dimensions of job insecurity, except for perceived threats to job features. Gender and, gender and age interactively do not significantly influence these dimensions of job insecurity. However, all the other biographical variables significantly influence the dimensions of job insecurity. Evidently, biographical profiles of employees that are susceptible to experiencing job insecurity do exist. Potential reasons include family responsibilities, fear of the consequences of change and policies and procedures on redress and equity in terms of gender and race. It is therefore, recommended that change managers take cognisance of these biographical influences in attempts to reduce susceptibility to job insecurity during a process of restructuring by designing appropriate strategies and channelling them to the relevant employees. This by no means implies that different programmes and information would be given to different groups depending on gender, age, tenure, race, number of years in current position and region. Instead, it means that all demographic groupings should be given the same information using different and appropriate approaches or, by bundling the different subgroups that have different roles. For example, if employees with greater tenure are prone to feelings of powerlessness, to enhance feelings of powerfulness, these employees can be allocated the role of mentors so as to ensure a feeling of belongingness and importance. In addition, the result of females exhibiting higher levels of powerfulness than males can be strategically and diplomatically used. For example, a joyful competition may be held and females may be asked to generate all possible problem areas in the change process and males may be asked to respond with potential solutions. Interesting and fruitful outcomes can be achieved in this way thereby turning a potentially stressful change process into fun and games, which also has the potential to balance differences in powerfulness/ powerlessness. Adopting such an approach to address demographic differences ensures that strategies implemented are appreciated in the spirit of diversity management rather than an unfair labour practice or discrimination. Furthermore, programmes, information and interventions should emphasise how family responsibilities may be maintained and should focus on continuous social responsibility. Older employees should be given honest information and should be allowed to provide input into change initiatives, and the organisation's stance in terms of gender and race compositions and the direction that the organisation is taking in terms of these must be clearly communicated. The study was conducted in a particular telecommunications company and the results cannot be generalised to other telecommunications companies or other organisations that are undergoing major restructuring. Furthermore, the study assessed susceptibility to experiencing job insecurity using a cross-sectional data collection method. Due to the lengthy duration of a major restructuring process, it would be valuable to assess the prevalence and magnitude of job insecurity using a longitudinal time frame such that comparisons can be made before, during and after the process of transformation so as to assess whether differences in the magnitude of job insecurity during a period of major change exist and when it is the highest.